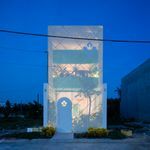 This tube house in suburban Saigon looks ike a residential structure, a spa and a Buddhist retreat rolled into one. According to ArchDaily, the townhouse was built in 2017 and is currently the home of a seven-member household. Therefore, the minds behind H.A. Architects faced a challenge: how to provide ample living space for seven people on a four-by-eighteen lot. LESS house was designed to overcome these spatial limitations: the partitions separating rooms are movable and the corridor also doubles as space for a bathroom. The abode incorporates distinctly Asian elements such as futon beds, Buddhism-themed decorations and extensive use of natural wood.